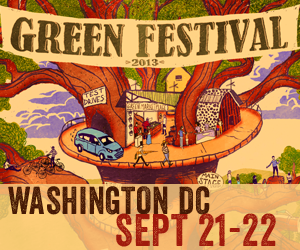 The Green Festival, the nation’s largest environmental consumer event, returns to Washington DC on September 21-22, 2013. Featuring hundreds of eco-friendly businesses, the Green Festival marketplace is a great resource for seeking out new and innovative green products. The Green Festival features influential speakers such as Amy Goodman, Award-winning investigative journalist; founder and host of Democracy Now! ; Bernadine Prince, Co-founder and Co-Executive Director of FRESHFARM Markets; David Feldman, Executive Director of Bethesda Green; Seth Goldman, President and TeaEO of Honest Tea; Wenonah Hauter, Executive Director of Food & Water Watch; Todd Larsen, Corporate Responsibility Director for Green America; and many others. An organic beer and wine pavilion. Live cooking demos featuring delicious vegetarian cuisine. A dedicated kids’ area for learning about easy and fun ways to incorporate green at a young age. Rounding out the offerings are informative workshops that are designed to empower and educate the public on living an eco-friendly life. In addition, attendees will be able to participate in the Community Green Grant sponsored by Ford Motor Company and Green Festivals. A grant of $5,000 will be awarded to the proposed project that receives the most votes. Want FREE tickets? Use this link: http://www.greenfestivals.org/dctickets13 and code DCGFHOST13 to redeem a free weekend pass.